Earth & Sky Limited Partnership, a joint venture between Earth & Sky and Ngāi Tahu Tourism, has welcomed today’s announcement from Prime Minister John Key that the Ministry of Business, Innovation and Employment (MBIE) will co-fund the construction of an International Astronomy Centre on the shores of Lake Tekapo, through its Tourism Growth Partnership. The new state-of-the-art facility will add to the existing astro-tourism experiences currently on offer through Earth & Sky and will provide a new day-time astronomy experience. The Tourism Growth Partnership will provide $3 million in funding, and an extra $7 million will be raised by the partners. Earth & Sky Limited Partnership Chairman Graham Kennedy says the facility will be designed as an iconic building of significance, themed around astronomy. “Lake Tekapo is already considered among the best locations in the world for stargazing,” says Mr Kennedy. 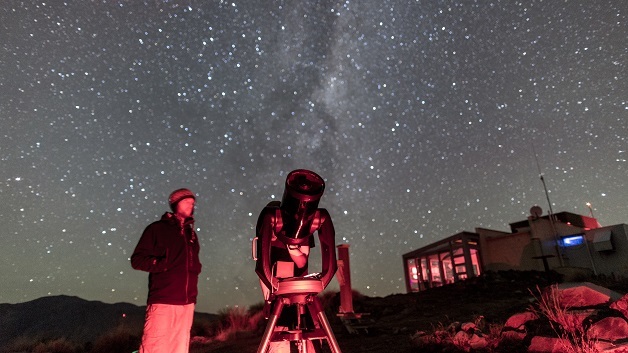 “An International Astronomy Centre alongside the University of Canterbury Mount John Observatory will draw more visitors to our country and to the South Island, offering a unique year-round attraction that they can enjoy during the day or at night. The visitor experience at the new ‘Window to the Universe’ Centre will include virtual reality and an interactive science and education area. In this space, visitors will be able to learn about the founders of astronomy in New Zealand and discover how early Polynesian and Māori people used celestial navigation. They will also be able to dine at the café/restaurant or enjoy a drink in the Star Bar, all while enjoying the stunning Tekapo landscape both day and night. In September, Ngāi Tahu Tourism announced it was entering a 50/50 joint venture with Earth & Sky. Ngāi Tahu Tourism Chief Executive Quinton Hall says the new facility will have a positive impact on the regional economy while also supporting the aspirations of the iwi. “The International Astronomy Centre will be nationally and globally recognised for the unique experience it offers, so we look forward to seeing this project come to life over the next two to four years,” says Mr Hall. The Tourism Growth Partnership funding will be used to construct and fit-out the building, which will also showcase a 125-year-old Brashear Telescope and other historic astronomy equipment.